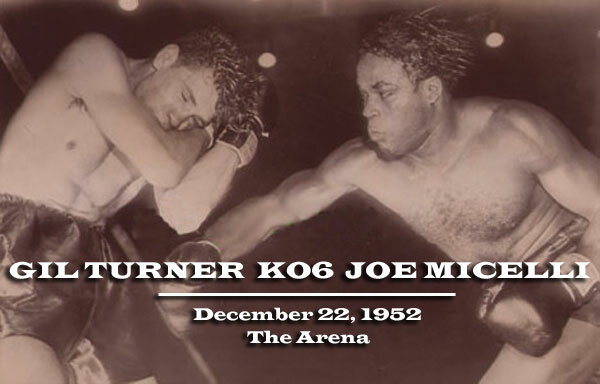 On this day in 1952, North Philly's Gil scored a sixth round TKO of Joe Micelli to further rebound from the title-fight loss he had suffered earlier that year against Kid Gavilan. After a tough first round, Gil poured it on for five rounds and took it to Micelli who just couldn't match Turner's fire-power. But when referee Pete Tomasco stepped in to stop the bout, the Arena crowd of 5,491 hadn't had enough. They roared with disapproval, feeling Tomasco had acted a bit hastily. But the decision stuck and Gil Turner recorded his 33rd victory.